Music & Want to learn it on guitar or ukulele ? Manu and I dancing the men's version ! A ‘Ori Tahiti Flashmob ? Let's dance all over the world the same day, the same choreography of 'Ori Tahiti - Tahitian dance ! It can take place on the weekend of the official date or at another time if necessary, the important thing is to gather the greatest number of dancers in a common joy of dancing. The choreography is released several months ago for free on YouTube / Facebook, with a complete tutorial explaining steps, gestures and meanings. Thus a person can either learn the choreography directly from home or with a teacher who has learned it upstream. In each city, the event is organized and managed by an association or a person who makes himself known to the instigators via the registration form. The organizer must create an event on the facebook page of his dance school and name the "Flashmob Ori Tahiti" page as co-organizer. Thus, the official Facebook page lists all the places, associations and participants ! This is a completely free and volunteer project for both participants and organizers. The Flashmob aims first to make known the 'Ori Tahiti - the Tahitian dance - in the world. It is indeed a complete discipline based on the enriching values ​​of a culture. If the Ori Tahiti extends more and more to Japan and Mexico for example, still few people know him in the French metropolis and in other countries of the world. The Polynesian associations struggle to get out of the vahine cliché that people have in mind, it is an opportunity to change ideas ! Few Ori Tahiti teachers share their choreography online, they want to protect their work and creativity. However, many countries suffer from a lack of training in Tahitian dance and some associations that come together for the sake of Polynesia do not necessarily have competent teachers who can create their own choreographies. Mareva wants to bring a solution to these associations. For years, she has received requests for the use of her choreographies, and some associations have already hired her as a choreographer at a distance. As each event usually takes place in a public and well-known public square, associations can take advantage of it to make themselves known to the general public. We spend a lot of time explaining to people what Tahitian dance really is, which remains relatively unknown as a complete and complex discipline. From year to year, this project allows to gather and make feel and integrate to the dancers that they are not alone, that we are everywhere in France, in Europe, in the world ! For Aurore Legrain, the initial idea was to gather, to unify the Polynesian associations that sometimes create wars to share the "French market". But the sun shines for everyone. Aurore was confronted with these problems when she took over the presidency of Hoa No Tahiti and she wanted to create a benevolent event in which only the positive energy of sharing would find its place. Aurore Legrain and Mareva Bouchaux met at the Heiva i Paris 2015 where Mareva won the first prize in the Aparima category - soft choreography - and a few months later Aurore contacted her to launch a Flashmob of Tahitian dance as a choreographer. A friendship was born and developped since, despite the distance! Aurore Legrain was at the time president of the Polynesian association Hoa No Tahiti based on Liffré (Rennes, France). 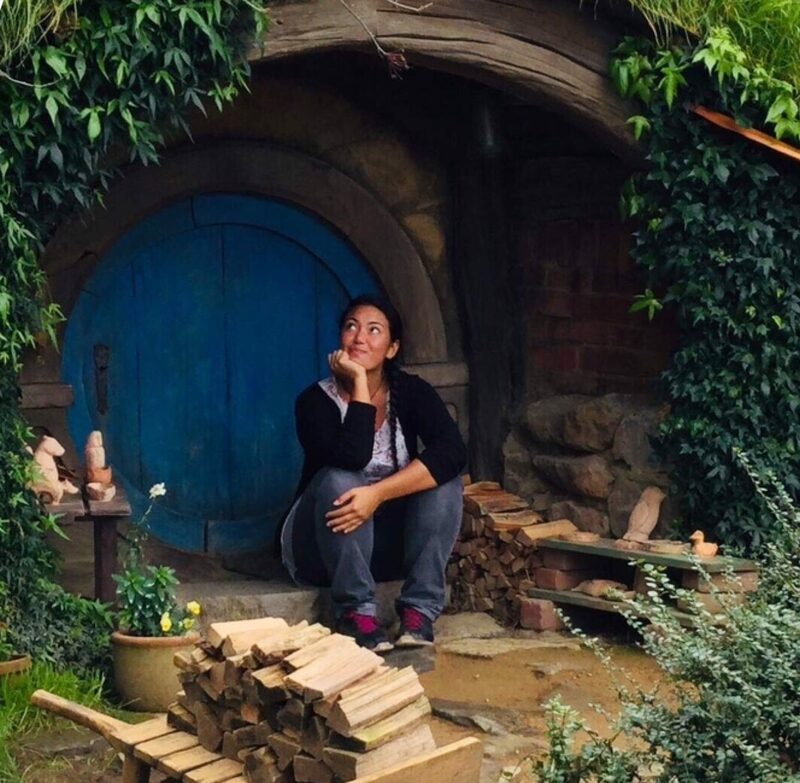 For her part, Mareva Bouchaux is founder and artistic director of the Polynesian association Reva i Tahiti in Aix-en-Provence and Toulon, she teaches in her school but also throughout Europe for workshops. 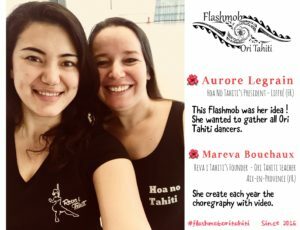 In 2018 Karina Cáceres had the opportunity to meet the Flashmob Ori Tahiti mouvement by the hand of Mareva and together with Henry Cifuentes, her boyfriend, they could see that many countries had joined this great world event, but there was no universal logo that join them and at the same time belong to each country or city. The flower in the center, is Mareva, motivating all this movement for the Ori Tahiti. Waves that travel from different oceans to the center and intertwine with shark teeth, like clinging tightly to a same choreography. These are some of the characteristics of this logo, which was a gift from Concepción - Chile to Mareva and the world. The Flashmob was a great success, especially in Paris and Barcelona with about hundred participants. Around 450 people have been identified in Europe. Some photos were retrieved here and there but the organization was not yet developed enough to register everyone. The video has been fully filmed and edited by Mareva who has no special skills for it, with a personal digital camera. The music chosen was Taura by Tamari'i Hauti, a piece played and sung by a collective of Polynesian artists who spoke of "gathering all together and believing in our dreams". 2018 saw the number of participating countries explode ! 25 countries represented by a total of 60 cities ! On a music by Sabrina Laughlin : Aroha No Tahiti. The video has for the first time been filmed and edited by friends Pascal Rigaud and Cyril Zattara whom we thank very much! There were about thirty cities including Paris, Barcelona, ​​Madrid, Berlin, Papeete, Toulon, Strasbourg, Bordeaux, Nantes, Rennes, Aix-en-Provence, St. Petersburg, and even Montreal and New York, which however slightly deviated from the original concept . The information was published in several local newspapers and on Polynesian television. The Flashmob post organization has been improved but once again, the diversity of video and photo-recovered media has not yet enabled the production of a conclusive video to summarize the event. The video was again filmed and edited by Mareva who added subtitles manually in English and Spanish. The Flashmob Ori Tahiti 2019 will take place on Saturday, May 25th. The output of the tutorial is planned as every year for January 2019. Finally, great novelty of the year, the choreography will be created on an original music specially composed for this edition!